Physical medicine is a practice that centers around treating diseases using physical modalities and techniques. As the Lowcountry’s premier physical medicine practice, Advantage Healthcare of Charleston (AHC) takes a comprehensive approach when it comes to back, neck and knee pain relief. Let’s take a look at how our physical medicine practitioners combine joint injections with physical therapy to manage pain. A patient may be in too much pain to participate in active physical therapy regimen. 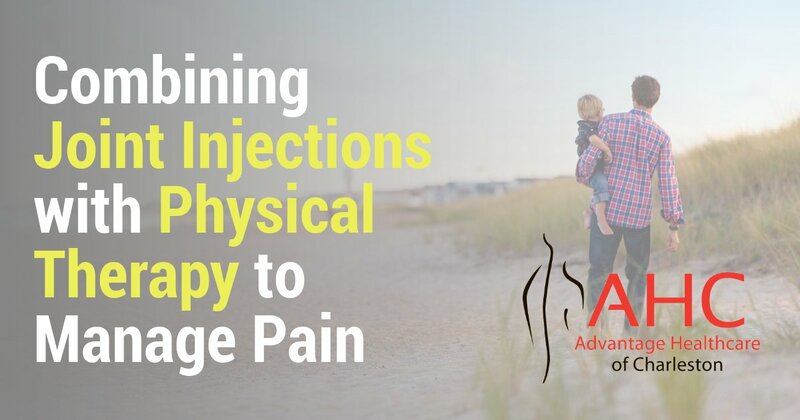 In cases such as these, we often suggest joint injections as a short-term relief for pain, which then allows the patient to be able to participate in active physical therapy designed for more long-term pain relief. Joint injections can offer quick pain relief, but they do not address the root cause of pain. Physical medicine often incorporates physical therapy as part of an overall treatment plan. Not only does physical therapy aid the body in recovery, but it also helps reduce and prevent injury and further pain. Joint injections and physical therapy – better together! Patients who are experiencing various types of joint pain often benefit from a comprehensive treatment plan which includes both joint injections and physical therapy. While joint injections alone can stop the pain fairly quickly, they only offer temporary relief. Physical therapy, when prescribed as part of an overall pain treatment plan, is designed to re-train the body to be in proper alignment, decrease muscle tension and strengthen muscles to prevent further pain and/or injury. If you are experiencing either chronic or acute pain, give us a call today. You may be a candidate for joint injections, physical therapy or other physical medicine services. We will thoroughly evaluate your condition, identify the root cause of your pain and develop a customized treatment plan designed to help you recover.